I first picked up this book because it had a ventriloquist dummy on the cover. I was not sure what a dybbuk was but learned that it was the equivalent of a Jewish Ghost. This is the story of a ventriloquist who is not very successful. That is until he returns to his room one night and finds someone waiting. He finds out the someone is a dybbuk. He wants something from the Ventriloquist. He needs to inhabit his body in exchange he will help him. Against the entertainer's wishes the dybbuk enters his body and soon begins to speak for the dummy. They become a hit. The dybbuk needs the help of the entertainer to track down someone from his past. It seems the dybbuk, when alive was a young boy named Avrom Amos Poliakov. When is was alive he and his sister Sulka were hiding from the SS officers who took great pleasure in hunting down Jewish children, bagging them and then killing them. Avrom watched helplessly as his sister was poisoned and died. Avrom was eventually shot by the same officer. As a dybbuk he has unfinished business. Find the SS officer who now lives as a Jewish victim and get revenge. I loved this book. 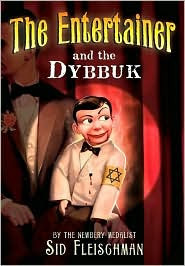 The mystery of why the dybbuk was possessing the entertainer and for how long kept me reading. As I neared the end I was on the edge of my seat to see what the dybbuk would do. I was very pleased with the way the book ended. About the time I think I have heard all of the things the Nazis did to the Jews I learn something new. This was based on historical fact. The author did a wonderful job of telling it like it was and in a most respectful way. He let the dybbuk and his humor tell the story. I can't wait to recommend this now that I truly understand what this book is all about.